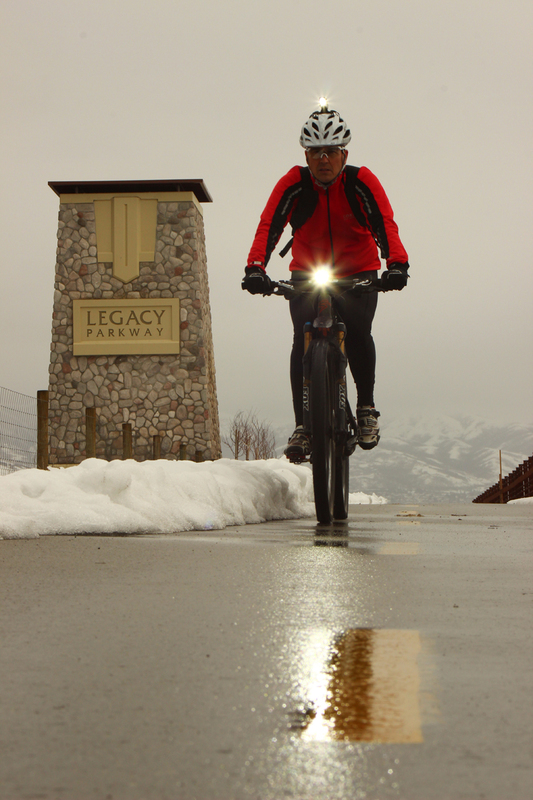 My previous commuter column (March 2013 issue) was a Salt Lake County based cyclist. For this month I am moving north to Davis County to profile Ken Gibbons who rides early, long, and throughout the year. Cycling Utah: Ken, your children seem to be quite successful. Before we discuss your bike commute tell the readers about yourself and family. Ken Gibbons: I’ve got a really cool family, IMHO. We are Mormons and do the meeting gig every Sunday, but found our strongest tangible bonding in cycling. I never sat the boys down for a father’s interview, but we had countless heart-to-heart chats riding, while working on bikes or driving to Moab. They would choose to go riding with mom and me over playing Nintendo with friends. Last summer, our youngest returned from a 2-year mission in France. The top priority for the homecoming was to go for a classic family ride. It was a little heaven on earth because family is what it’s all about. The boys are tall and lean, definitely genetically mutated from stubby me. At various times they’ve won their classes at the Snowbird and Porcupine Hill Climbs, High Uintas Classic + KOM, East Canyon Road Race, mountain bike races, and stood on the podium at LOTOJA. But they chose school first, and didn’t have the time to concentrate on racing. Our oldest is now at NYU medical school in Manhattan, occasionally riding laps around central park. Our middle son, who’s getting an engineering PhD at Stanford, is a Cat 3 on the cycling team. Our youngest did his first century at age 11 on a mountain bike. He is studying engineering at Utah State. They’re great guys who know to sit up when they hear the “angel of death”, my Garmin’s 185 bpm heart rate alarm. My wife is a schoolteacher. She has ridden the ULCER and does a metric at the annual Little Red all women’s ride. When the boys were younger she would ride Slickrock and Mueller Park with us. I don’t know if she liked those rides, but did them for us to be together. We have great memories. I am 54 years old, and I’m not a fitness nut or health fanatic. My metabolism’s cruise control has always kept me at 20%+ body fat, no matter how much I exercise or how little I eat. I consider myself an able rider, I did a 10h45min pedaling time LOTOJA, having my wife hand me pizza at one feed zone. I’m not a competitor and don’t “train”. But last year I did a several early spring races when I had an advantage from commuting all winter, winning my citizens class at the Bear Lake road race, and second in my class at the Cactus Hugger mountain bike race. school” with cables, chains and gears and the traditional diamond-shaped frame. Tell me what is technologically fascinating about bikes? Our biking forefathers got it right a long time ago with their diamond frame design, still the most efficient configuration. From my warped mechanical engineering perspective, the new technologies I’ve watched improve the cycling experience are: 1. Index shifting; 2.Mountain bike suspension; 3. Use of carbon fiber; 4. Tubeless tires (I run them on my road and mtn bike); 5.Garmin type cycling computers; 6. LED light technology. Modern components such as the Campagnolo Super Record 11 are pieces of art. miles. When did you decide to become a bike commuter and why? K.G. : I’ve had bikes my whole life, finally getting a serious road bike in 2005. I thought it would be novel to commute to downtown SLC, and park it in my office, not that anyone would know what a serious road bike looks like. Riding through heavy Bountiful traffic and then dancing with the cars in the downtown automobile criterium ruined the fun factor. I survived that 48 mile round trip 3-4 times a year. My employer relocated to southwest of the airport about the time Legacy Parkway was opening, so I started regularly riding that 58 mile round trip. A year later, I noticed that my upper extremities were getting stiff and sore, but curiously, my lower extremities were fine. I was diagnosed with rheumatoid arthritis, where the immune system destroys the body’s own joints. Hmmm… had regular bicycling been helping my legs? The doctor said yes. So putting off looking for a tricked out wheelchair is a pretty good reason to commute! I’m not a radical environmentalist, and I don’t think I am personally saving the planet by riding to work. I tell people who think I do it to save gas money that I probably spend more on energy drinks and gels riding than I would on gas for my car. I’m actually humored by my eccentric oddball reputation I have at work for commuting 58 miles, I’m the only one who rides. From my secure indoor parking, I walk through our industrial manufacturing plant to my office and shower. I think that my shaved legs and Lycra tights initially creeped out a lot of the shop guys, but they are used to me now. On winter mornings when I walk inside from 15-degree darkness, they look at me extra funny, but it’s all flattery to me. On a 5-degree morning last winter a guy said he bet I was glad I hadn’t ridden that day. Actually, I did ride that day. C.U. : Getting out the door at 5:30 AM to ride to work is admirable. What is it like to be out riding at that time of the morning? K.G. : Morning rides are glorious at 5:30 am. It’s quiet and peaceful except for the sizzle of car tires on the parkway in the distance. I especially like a light snow flurry. I’ve survived close encounters with skunks, foxes, pheasants, deer, snakes, AWOL dogs, and mounds of horse manure. I don’t drink caffeine, but I do power up with a caffeine double shot gel pack and a banana for the ride. I don’t know if it’s the sense of accomplishment or the ingested stimulant I feel, but it’s quite euphoric. It’s a great launch for the day. K.G. : Total ride time per day is about 3h15m in the summer and 4h10m in winter. I put my smart phone in my backpack shoulder strap pouch and listen to a hard rock Pandora channel through the speaker (never, ever isolating ear buds). One really cold morning, as I was on my driveway turning on my lights and resetting my computer, the first song to play was “Kick Start My Heart” by Motley Crue, which begins, “When I get high, I get high on speed (meaning velocity)…” Not that I am fast, but that’s how I feel as I pedal into the dark. I’ll be honest, after a stress filled day at work, and watching the flag blowing the wrong way in afternoon 100-degree heat or 25-degree cold, sometimes I dread the ride home. The exception is when my wife can leave her classroom within a couple of hours after the bell rings to ride to meet me part way. I know her speed and the trail so well that I can tell her when to start riding and calculate where we will meet to give her a 20-mile ride. Reminiscent of the Beatles’ lyrics, “Something in the way she moves…” it’s marvelous how I can identify my soul mate from other riders a quarter mile away. She greets me with a salty, sweaty kiss and we ride home together. Life is good. C.U. : What would you say to someone that was contemplating a long commute like that to help that person mentally adjust? K.G. : I am very fortunate that all the variables align so I can do my commute. Obviously, routes and work situations are different for everyone, so I can’t make a silly blanket suggestion like, “everyone ride!” If someone asked, though, I would say, “I’m obviously not a natural athlete, and I can do it. So can you if you want to.” Build up some miles to acclimate your buns to the saddle, then just pedal. Enjoy the ride. When you get home that night, you will actually feel like you left work behind. Once you are used to it, you won’t notice the real time exertion. And if you must justify it, say you are saving the planet. C.U. : What is the route of your commute and how does it change with winter snow? K.G. : First off, let me say that the Legacy trail is the best thing about Davis County. I get on the rail trail through northern Davis County, which goes south to the Legacy trailhead at Farmington. It’s 17 miles from home to the end of Legacy in North Salt Lake, where I take the country road to 2200 W past Boeing and the National Guard on a wide bike lane. Reaching the south end of the airport, there’s a pedestrian path next to the runways to the business park to the west. From there it’s death row, AKA 5600W, a major trucking and commuting route for a couple of miles to my work. I just hug the road’s shoulder and hang on. I will never get used to getting sucked towards semi-trucks passing a few feet away at 60mph. In the winter, because they don’t plow the Legacy trail, I have to zigzag through neighborhoods and commercial areas to get to 2200 W in North Salt Lake. Per Pythagorean’s theorem on right triangles, it adds 3 more miles to the 29-mile ride one-way ride, with lots of stop signs, lights, and drivers checking emails while eating Egg McMuffins. C.U. : You discussed the lack of winter maintenance on the Legacy Trail. Can you discuss your efforts to have the trail plowed and the responses? K.G. : Usually the trail’s black top payment will soak up enough radiant heat from the sun to burn off periodic snowfalls. The few bridges over wetland areas stay snowy. This year, the big storms during early January put down so much snow so fast that the blacktop was buried too deep. So the trail was closed for a whopping 2-months! That seems like a terrible waste of a taxpayer investment. It’s ironic how the parkway marquee signs next to the trail say to drive less during winter inversions. OK, we would ride more, but the trail is impassable. Duh. In November I called Centerville City to ask if they could plow off the bridges. They said no, that would imply that the trails are maintained, and if someone got hurt on a subsequent snowfall, the city could get sued. They said the insurance company wouldn’t let them plow. I called Farmington to see if they would plow their section of the rail trail, like Kaysville does, and they gave the same insurance reasoning. I’m not a city manager, but can’t imagine it could be that big of an insurance hit compared to everything else they cover. And while snow removal isn’t free, the first sunny day after a storm when the roads are cleared, send the plow guys out on bladed 4-wheelers, and let them have some fun plowing the trail. Have signs saying that if you use the trail it’s at your own risk. C.U. : I understand there is a unique microclimate near the Great Salt Lake during your ride. K.G. : Absolutely. On my route, there’s a strong south headwind in the morning, and a strong north headwind in the evening. Every dang day! A weather guy I asked said it has to do with the water’s stable thermal mass, and the air temperature change cycles from day and night. Sure, I am riding for health and fun, but a headwind all the time gets old. In temperature extremes, it can get dangerous. On a 10-degree morning, riding 15mph into a 20mph headwind, you get a -14 degree wind chill factor. Been there, done that. And when the temperature is over 98.6 degrees, you get the toaster oven effect where convective heat transfer is adding heat to your body. In the summer I easily knock down two water bottles one way. In the winter, I’m lucky to get a few sips before the bottle nozzles freeze. C.U. : You use some very powerful lights. How did you make your choice and how do you adjust the settings? K.G. : I had some cheapo lights that seemed OK. I demo’ed some NiteRider products from Biker’s Edge bike shop, which convinced me they were worth the price. I ride with a 650 and 1500 lumen (remote battery) light. Isolated on the trail, I will put them both on 400 lumens, which is fine with no approaching traffic. I turn them both on full blast as I near the airport traffic. I have been brighted by a car! LED technology is a miracle. I mount the 1500 on my bars for down the trail, and the 650 on my helmet so I can illuminate things that aren’t right in front of me. As I approach an intersection with cars, I will look directly at the drivers, aiming a full beam dose at them until I see they have seen me. Works well! When it gets lighter in the morning as I approach my office, I turn both on that annoying but conspicuous flash mode. I have two NiteRider 2-watt Solas tail lights on the flip side. They are painfully bright if you’re close. They look like police car lights flashing in the distance. One light goes on the seatpost in flash mode, and the other on the back of my helmet in steady mode. I seriously, honestly feel safer riding at night with these two taillights than riding in the day. Instead of getting close call buzzed, cars will very deliberately weave into the opposing lane giving me maximum clearance as they go around me. When I get to work, I take the lights in my office and re-charge them with USB cables from my PC. Easy. In my opinion, if you’re going to commute in early or late hours, spend the money on lights and be safe. I don’t want to be morbid, but your family will think the cost of the lights is worth it. panniers? What do you like about these bikes? K.G. : Both bikes are pretty zippy for their intended usages, and when the lights and fenders come off for regular riding, they are a blast. I did 6200 total miles for the year. Riding that much, I will buy any mechanical or psychological advantage I can afford. I like to ride the Wilier in the summer because it’s fast and re-active. There are often people on Legacy to work with, and the Wilier allows me to go 24mph when it’s my turn to pull. But in the winter, I switch to the Santa Cruz full suspension mountain bike with 29er knobbies, goofy looking fenders, and a close ratio 11-23 tooth cassette. Its riding position is a bit less aggressive, so it handles better in tricky situations like on ice patches and crusty shoulder snow. Even still, I took an impressive digger on the airport bypass trail’s ice. I didn’t break my helmet and my company-issued PC still works, so all is well. I was lucky. Next year I may give studded snow tires a try. Since everything I need fits in my backpack, I don’t need panniers. The pack carries my cell, laptop PC, change of clothes, thermos of milk for breakfast cereal, and Weight Watchers TV dinner for lunch. I also carry a spare tire, spare tube, and a bunch of inflators. The pack weighs about 16 pounds, which is manageable but ever present. I initially feel like Superman when I begin a Saturday ride without it. Under similar conditions, the commute takes about 10 minutes longer on the mountain bike. But the instantaneously exertion isn’t any higher, as I ride by my heart rate monitor and adjust speed accordingly. I cruise at about 160 bpm. My dad died at age 60 from heart disease, and I don’t want to follow those footsteps. I justify my bikes by thinking of them as a durable medical goods expense. I wish the IRS would agree with my logic for itemized deductions. C.U. : Ken, what is your favorite bike shop? K.G. : Biker’s Edge in Kaysville. There are bike shops, and then there are biking community cores that also sell bike stuff. Biker’s Edge changed my life, having all the stuff to allow me to choose the right options for my needs and having the stuff in stock for my instant gratification. They are super friendly and never condescending because they deal with kids, beginners and pros, road and mountain. It's a fun hang out. I would have never updated my old road or mountain bikes without their inspiration and/or temptation. Their services like having high-end lights to demo are unmatched. I would like to give them a shout out as well as hint to others that professional, personal help is there. C.U. : Ken thanks for participating in the column and the update that Farmington plowed their section of the Legacy Trail at the end of February. Perhaps your call helped!